Emphasis, Longevity, and Organization: Our Keys To Success! 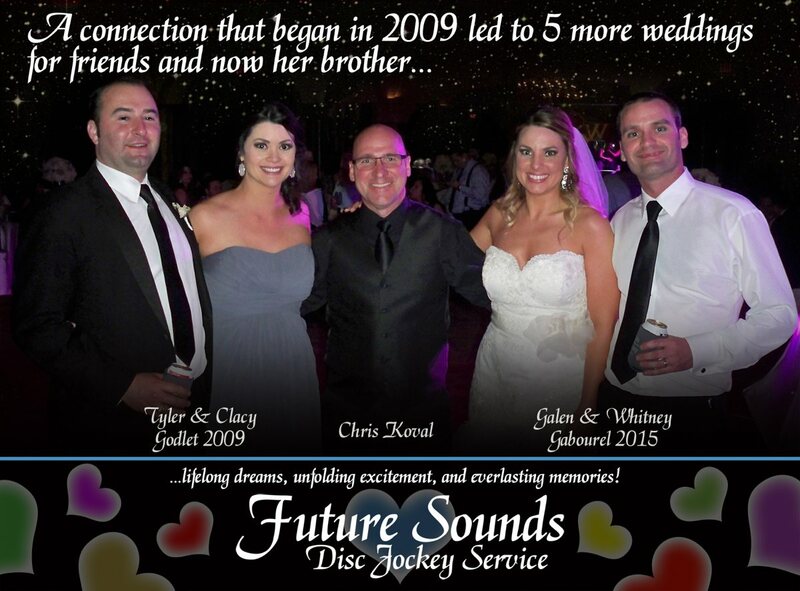 Emphasis, Longevity, and Organization do distinguish Future Sounds DJ Service L.L.C. from others. 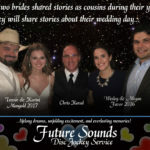 We take pride in our efforts to present this information because on the day of your event, the focus on the ingrained words above deliver actions that make a difference. Emphasis: This term is valued as twofold! We are first and foremost focused on doing good business. 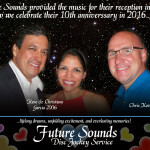 We began Future Sounds in 1998 by providing a valuable service to clients who liked our style of entertainment and business. A consistent delivery of our services built a reputation that emphasized confidence and comfort to our clients and other industry experts. This effort is a statute that we follow and respect every work day. 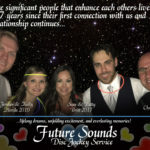 This attitude and direction allows us to develop better organizational methods, entertainment processes and tools to be used by our clients and incorporated at our events. Over the years we adjusted these tools and equipment to provide better services, packages, and accessories to be more effective and efficient. 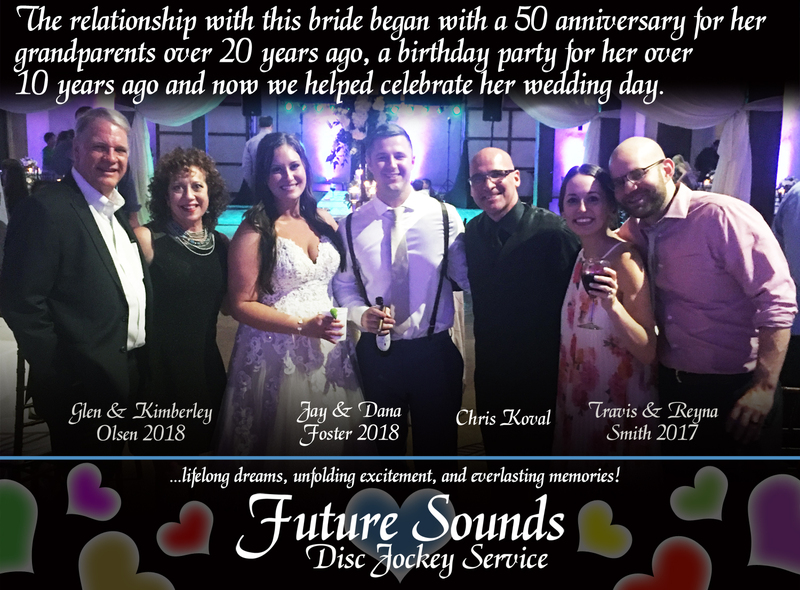 The experience gained by doing good business and events has made our clients continue to use our services again and again for nearly two decades. 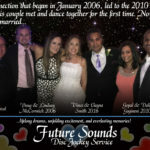 Year after year, we continue to provide our business and its services to repeat clients through their family, friends, and business connections. We are vested in what we do and take pride in not what is only visible, but even more so, take pride in supporting our industry groups and businesses behind the scenes by doing better and being a better business. 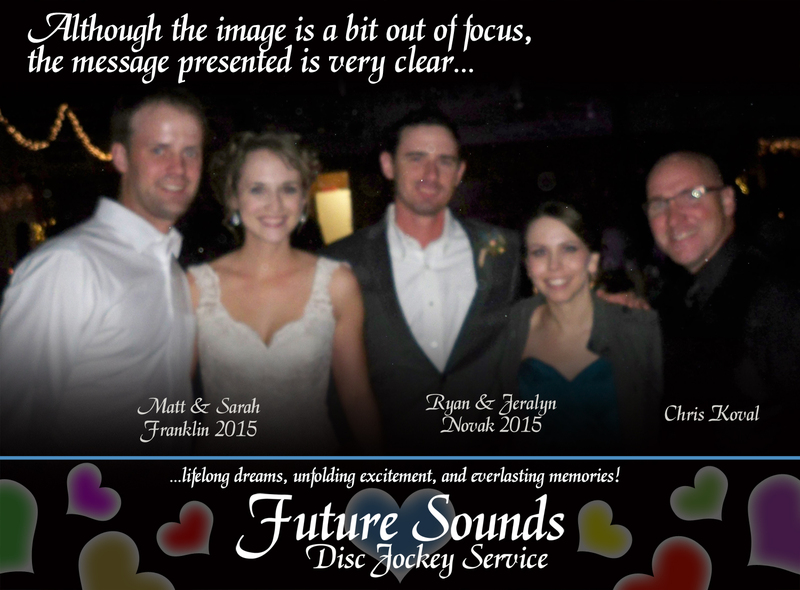 Secondly, although we provide our services at many types of events, we focus our attention on the wedding industry. 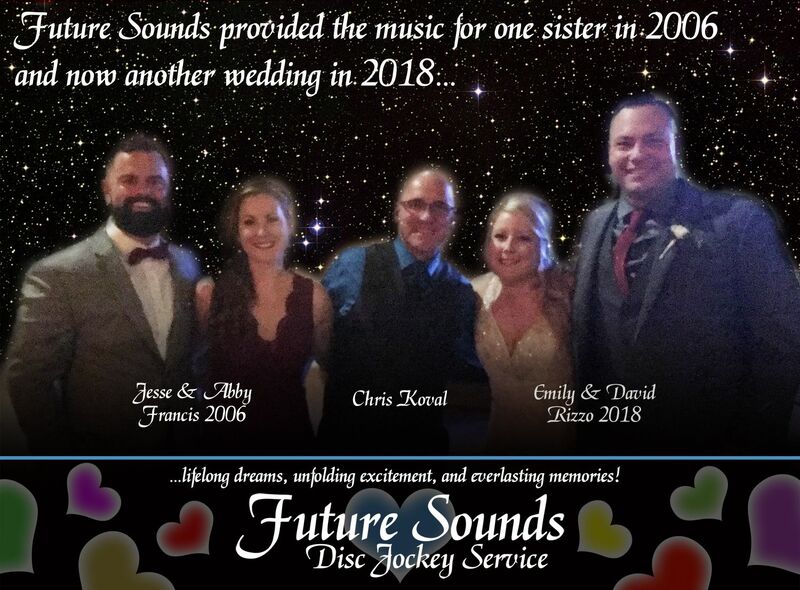 We are a wedding disc jockey service. We have tools that are geared to assist our clients in the preparation, organization and delivery of our services. 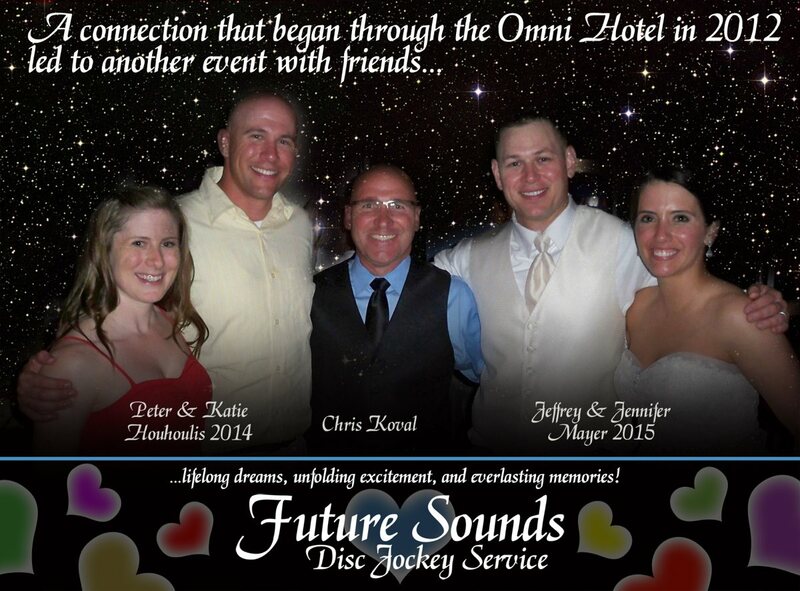 We use a simple framework that ensures success by direction and familiarity with each event and the process. 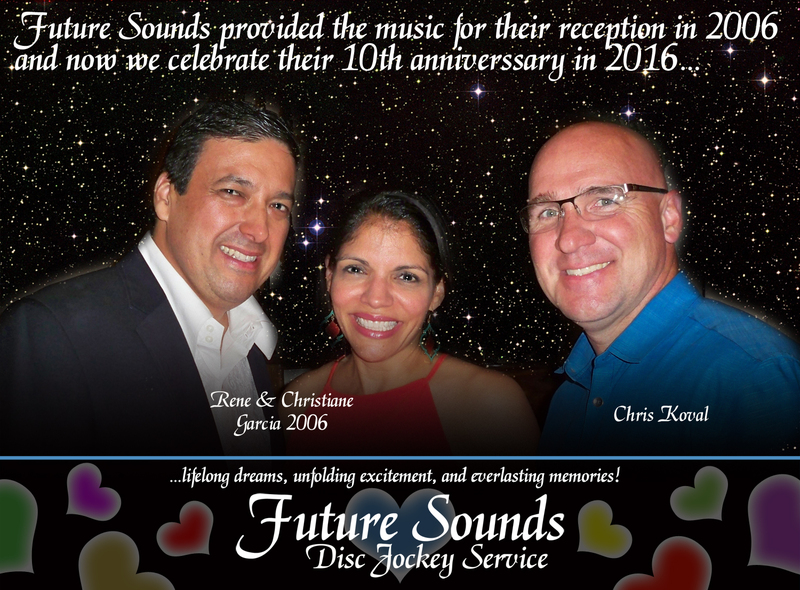 All aspects of what we do supports our foundation to deliver a memorable experience for all who attend an event. The experience differs for each person. 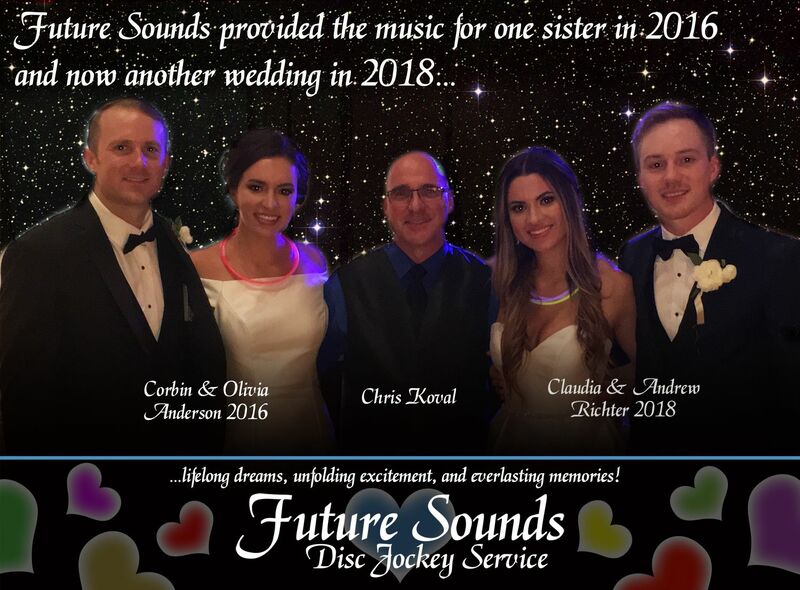 Our goal is to work with you to make not just a memorable wedding day, but even greater, create many memorable experiences that span family, friends, and business associates. This is the goal for each event. Longevity: Chris Koval has been actively entertaining others since 1985. 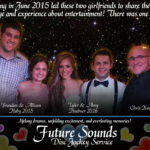 His career spans time in local TV, radio, stage production, and the club industry. 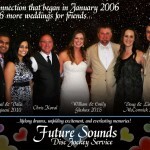 He has been active in the mobile and wedding industry since 1993. 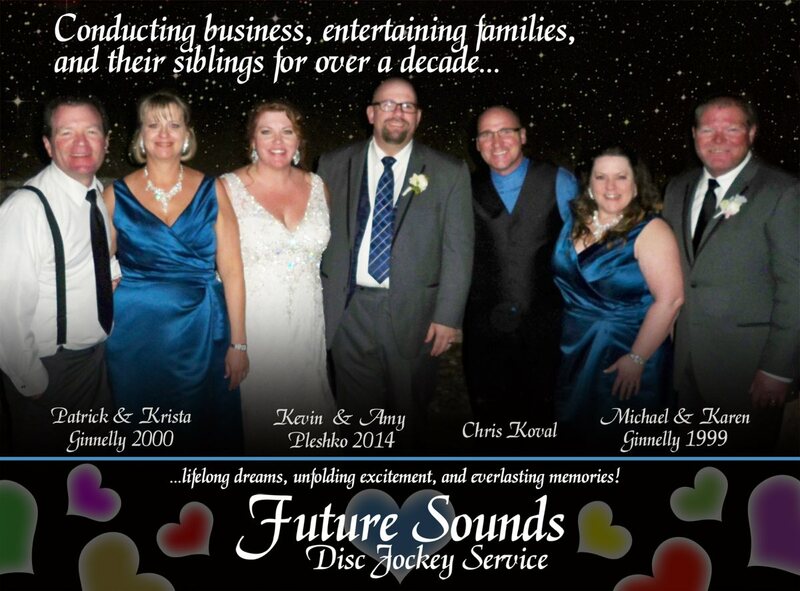 He has been doing business as Future Sounds since November 1998. 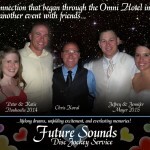 For 30 years, Koval has performed at numerous formal and informal events. 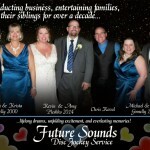 He has provided his entertainment services at thousands of private, corporate, and public events for nearly three decades. 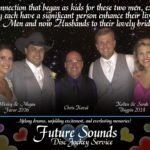 He has professional relationships within several industries and clients that continue to use our services time and time again. 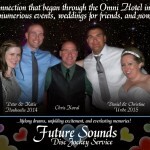 Organization: Koval takes pride in the methods that are used to prepare and organize each event. 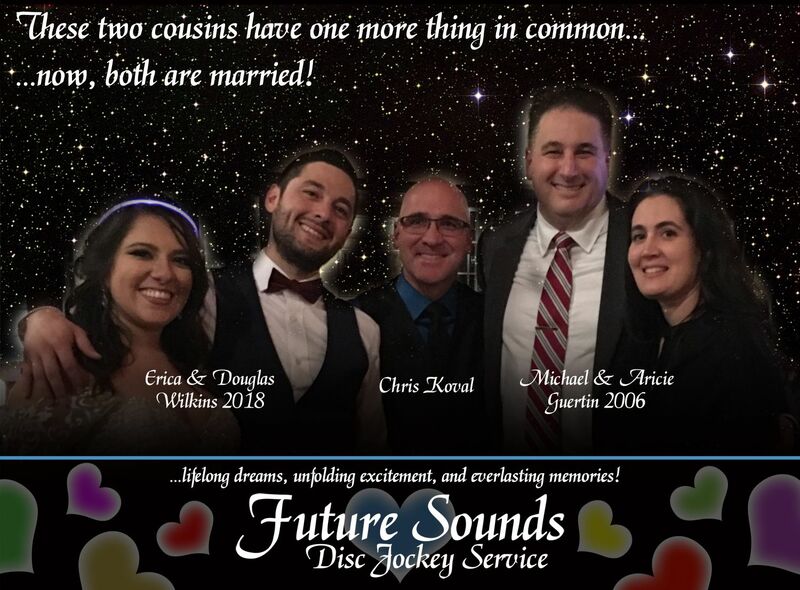 He has traditional paperwork that is shared with clients and visible on our website to better educate and assist anyone who is getting married and organizing a reception. Communication is essential for success. Usage of these tools make us mindful, up-to-date, and more knowledgeable about the details that surround the event. We share this information with other vendors to encourage collaboration and to be conscious of their needs during the event. 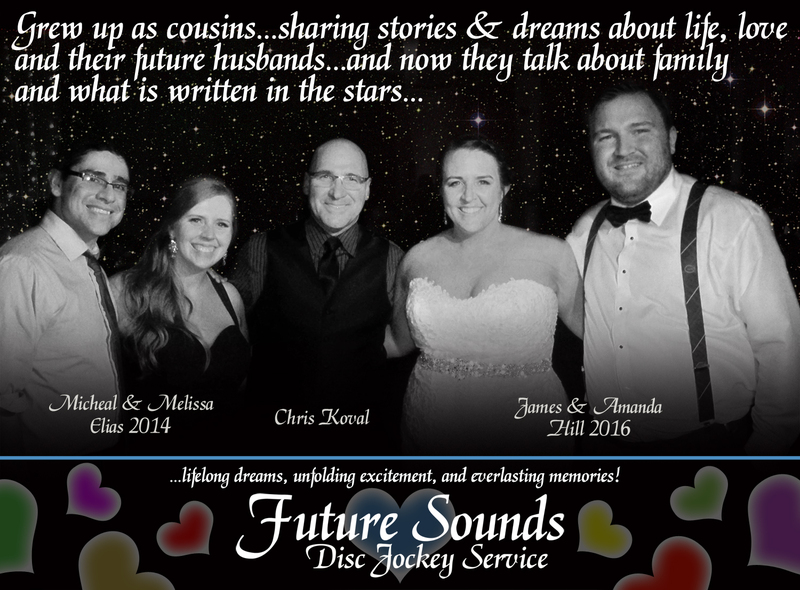 We take time to arrange and structure the theme and music surrounding the ceremony, cocktails, dinner, and the reception dance. As a client, you can interact with our tools digitally on the back end of our website. Although the process is the same for every event, details differ. 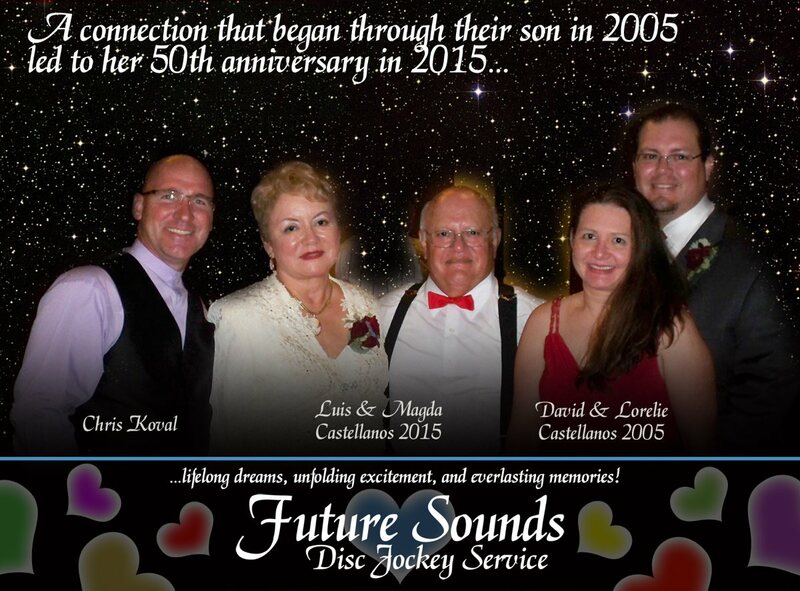 More About Future Sounds DJ Service L.L.C. 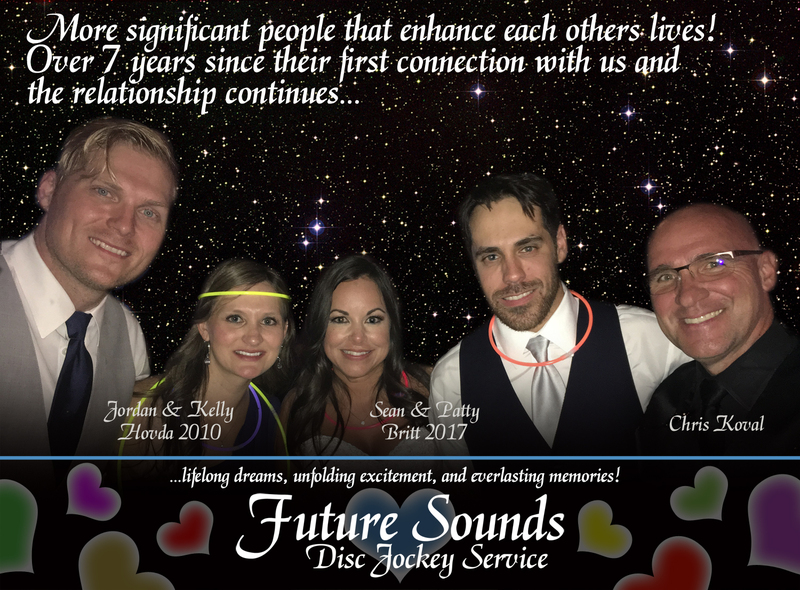 Based and built on over three decades of successful engaging events, Future Sounds provides an experience for clients that is extraordinary and unique for every guest. 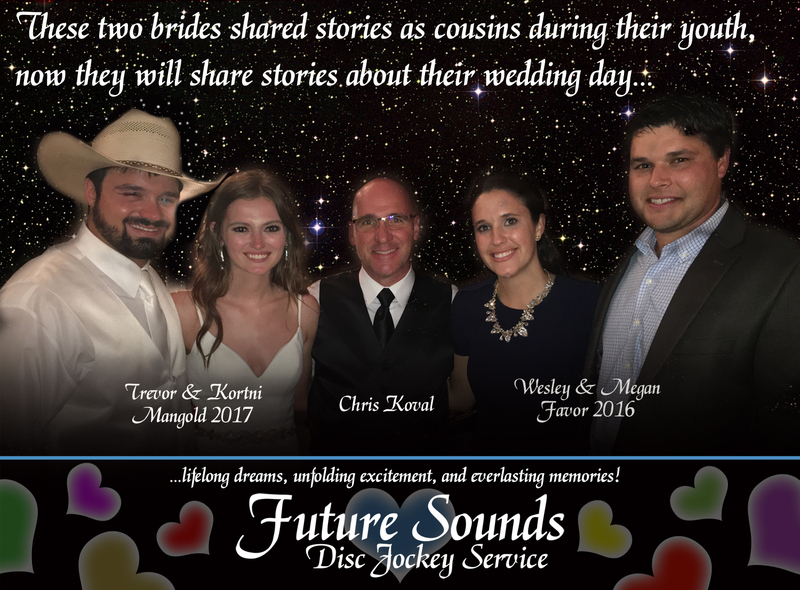 Koval's love for entertainment, music, and family extends the Future Sounds experience creating memorable moments and stories that will last a lifetime. The commitment to entertain requires an ability to work with diverse age groups, cultures and nationalities. 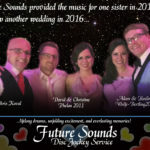 Future Sounds music library spans numerous genera’s as well as some world music. 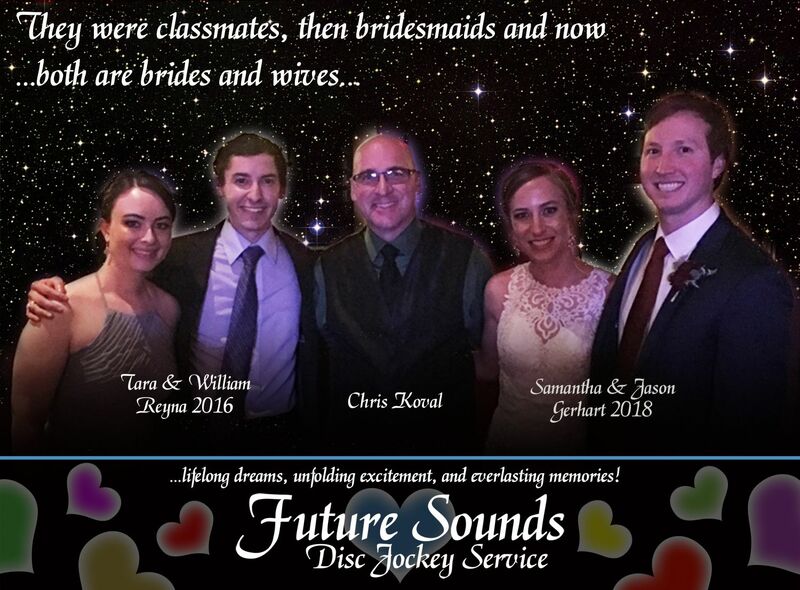 Whether your function is for two hundred or two thousand, Future Sounds can get the job done. 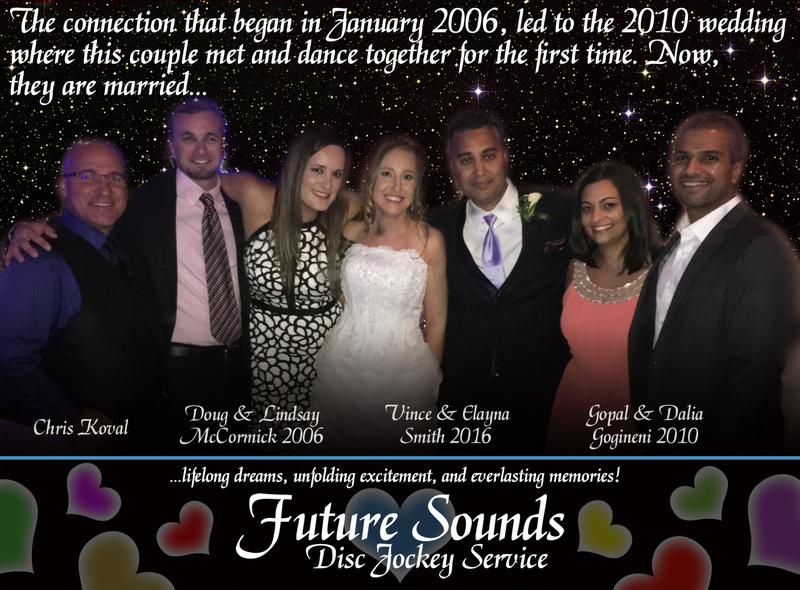 View over a decade of testimonials and listen to audio samples posted on the DJ page on this site. 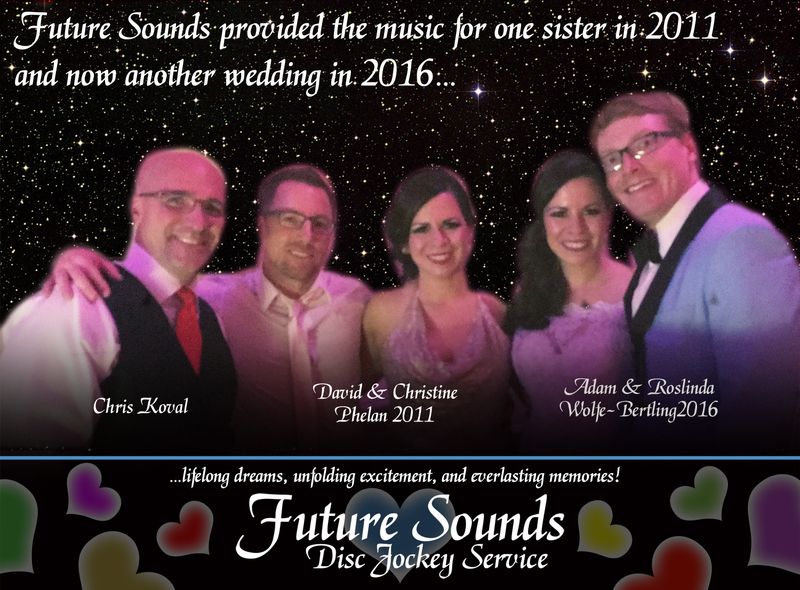 Although we have performed at numerous events since our inception, our focus has been on weddings. We have a passion for what we do! We show pride in our preparation and organization for each event. 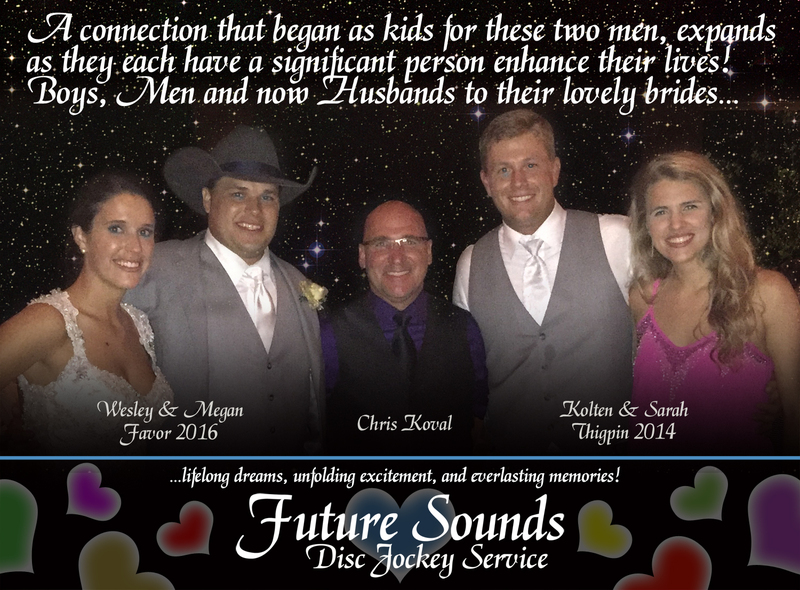 As a result, we have been a part of many new beginnings for couples, families, and their friends. 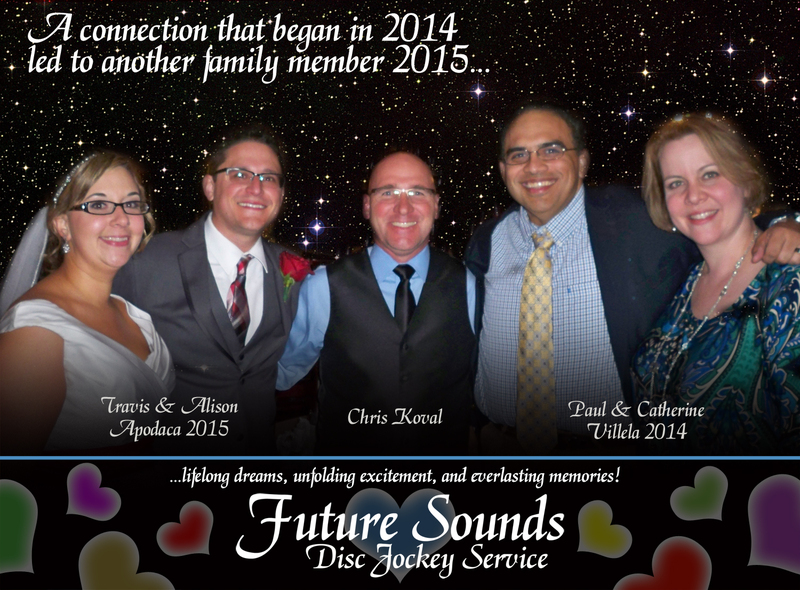 We become family through the reception experience and the memories are shared for years if not decades. 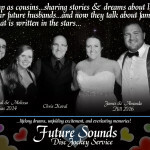 We have provided services for countless couples, their siblings and friends. 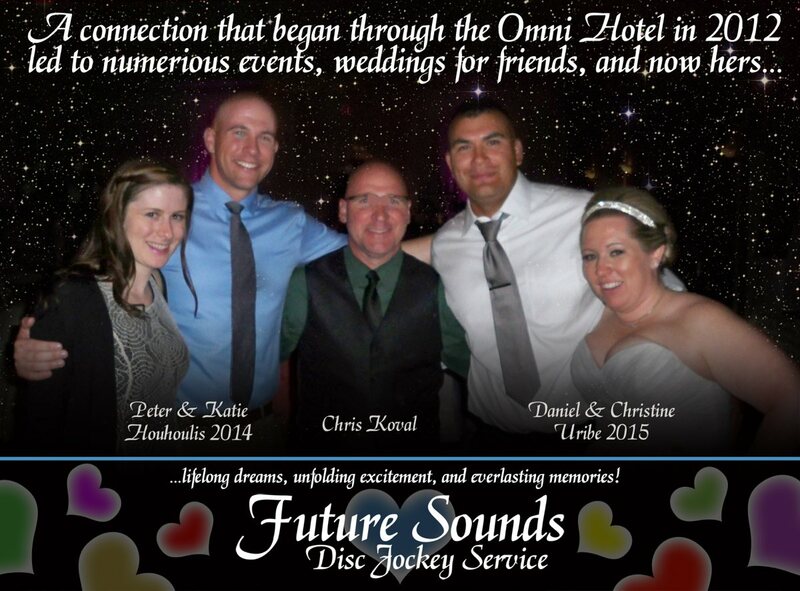 We do much more than just play the music at your reception. 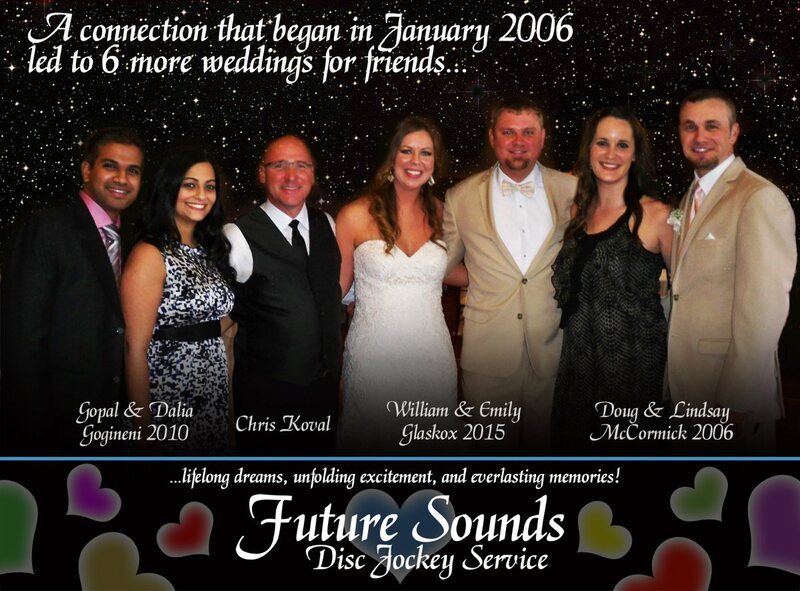 Our commitment to you and your event can be felt throughout the organizational process that begins months before your event. 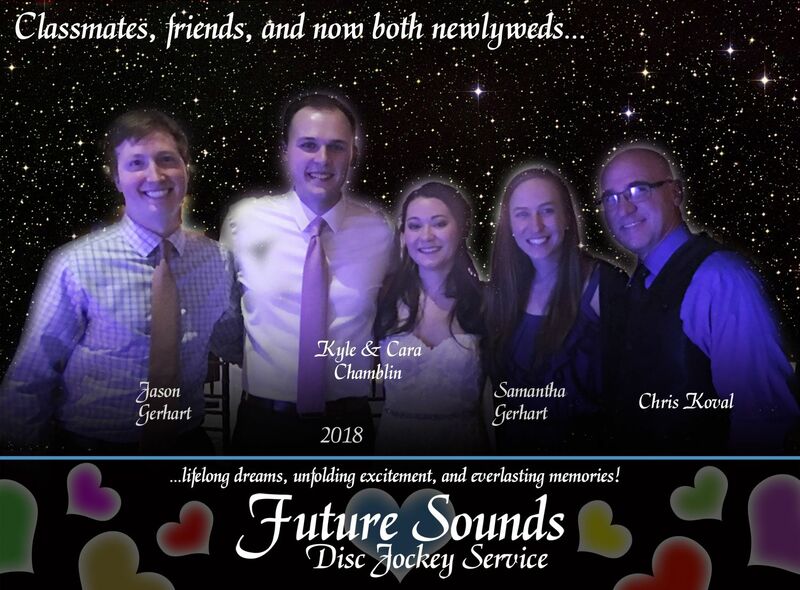 Future Sounds delivers more than a DJ service. 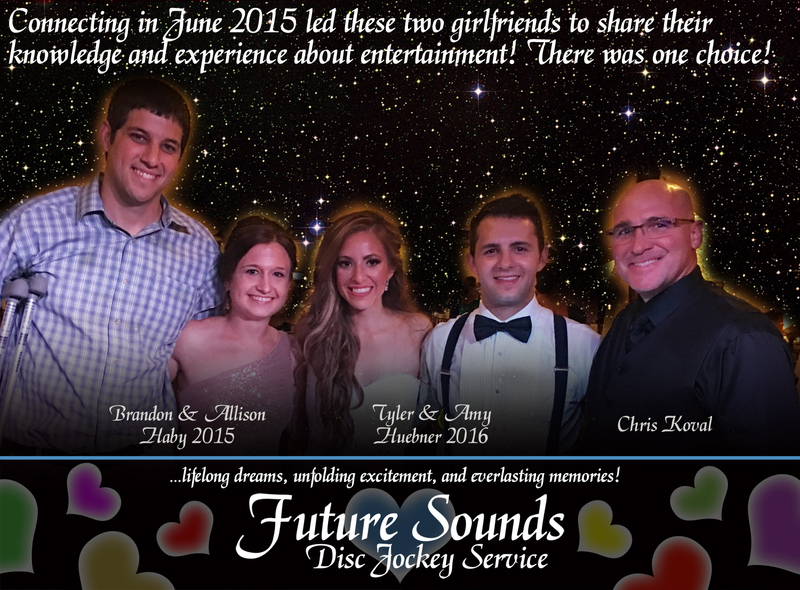 We deliver an entertainment experience! 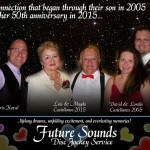 More information about Future Sounds, can be found throughout this web site.